Judge: Mr. Richard Archer, Quamby Plains, Hagley, Tasmania. A.R. & J.L. Hunt, 1; T. Manchester, 2. T. Manchester, 1; H.J. & C. J. Prell, 2; C. Turner, 3; St. Gregory’s College, 4; A.R. & J.L. Hunt, H.C.
C. Turner, 1; H.J. & C.J. Prell, 2; T. Manchester, 3; St. Gregory’s College, 4. A.R. & J.L. Hunt, 1; St. Gregory’s College, 2; C. Turner, 3. T. Manchester, Roseville, Kingsvale, NSW. C. Turner, Campbell Springs, Mt. Gambier, SA. with the Grand Champion Corriedale ram. C. Turner, 1; A.R. & J.L. Hunt, 2 and 3. A.R. & J.L. Hunt, 1; H.J. & C.J. Prell, 2 and 4; T. Manchester 3 and H.C.
T. Manchester, 1; St. Gregory’s College, 2. A.R. & J.L. Hunt, Wye, Mt. Gambier, SA. 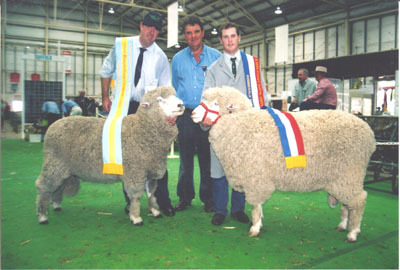 Class S210 – Best Corriedale exhibited by a secondary school, selected from exhibits in the general classes. Each animal must be bred or owned by said Secondary School. T. Manchester. (This trophy has never been won in Sydney before).